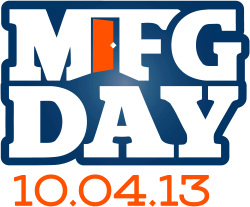 National Manufacturing Day – San Leandro Manufacturers Open Doors This Friday! MFG DAY addresses common misperceptions about manufacturing by giving manufacturers an opportunity to open their doors and show, in a coordinated effort, what manufacturing is — and what it isn’t. By working together during and after MFG DAY, San Leandro manufacturers will begin to address the skilled labor shortage they face, connect with future generations, take charge of the public image of manufacturing, and ensure the ongoing prosperity of the whole industry. This City has a proud heritage of manufacturing that has continued to thrive for decades. Companies like Ghirardelli, Kraft Foods, Coca-Cola, Applied Fusion, Koffler Electrical, Scandic Springs and many more are being joined by a new group of manufacturers, emphasizing San Leandro’s continued leadership in developing a new generation of jobs that requires an educated workforce. This Friday three San Leandro companies will open their doors for tours by the public. We invite and encourage you to register for these tours and see manufacturing and its econonic opportunities in a whole new light! Friday October 3, 8 a.m. – 1:30 p.m.
Friday October 3, 8 a.m. – 5 p.m.
San Leandro: We Make Things! I think Manufacturing Day tours for the public are a terrific idea. I’m sorry I was not able to participate this year — I hope this will be an annual event. This is the first time I have seen the tag line San Leandro: We Make Things! I really appreciate your efforts to target/brand SL. I think “we make things” is an effective slogan, and look forward to seeing it used more.